Submitted by Migrate Wizard on 2014-06-28 12:11. This Dye Kit will allow players to dye thier Clothing, Helms and Cloaks to any color they wish. Offering an easy to use menu of colors, the user is even told the current color of thier clothing so they may revert to it if they wish. The scripts included are fully compatable with SoU patched to 1.68 and up. Updates: 1/10/2004 - Added the Clothing Builder chest to the ERF. 8/30/2006 - Added the ability to alter the colors of cloaks. This is a Mail System for Persistent Worlds. Users can setup Mailboxes, then receive Mail messages from other users. Messages are stored in the NWN database system. New in this version: You may filter the Mailboxes with a text string or send a message directly using the Mailbox ID. Many DM features added, including the ability to disable/enable Mailboxes and view messages sent to your players. May 12, 2004 - Small update to help fix some user problems. 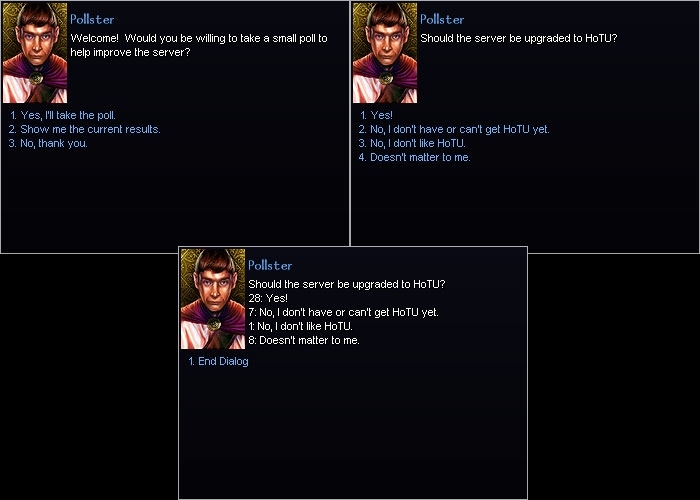 This is a Poll System for Persistant Worlds. Using this system setup a Poll Question to ask your players with up to 9 responses. Results are stored in the NWN database system and also output to the Log file. Requires latest NWN patch so you can modify Variables on the Pollster. This could be changed to setting the variables using an OnSpawn script though. This is a generic set of scripts to create lockable shackles and other objects (Torture devices, stocks, whipping posts, and more). These scripts allow one player to lock another to an item in a variety of positions (animations). The prisoner must be within 3 meters of the item to be locked. Once they are locked to the item they can be striped, repositioned, rotated or unlocked. After the jailor selects the postion and prisoner to lock, and conversation pops up to the prisoner allowing them to confirm or deny being locked. The scripts will also lock NPCes. The ERF includes 36 scripts, 2 conversations, 10 example placeables, 1 item and 5 positions to lock people into. To create your own lockables just follow the instructions in the included Readme file. Also included in the RAR is a sample Module showing the lockables in use, with 2 NPCes that you can test on. Using the Tailoring Models, anyone can modify or create clothing. The Tailoring Models can use any clothing model included in your module through HAK pack, and remove the blank entries that make the Crafting Skills difficult to use. It does this through cached 2DA reads of the parts_###.2da files. The Tailoring Models can also copy the appearance of clothing you have created to your current armor, if the base AC matches. This is a pack of Toys I created for my server, Mandragon Estates. Included are: Blindfolds, Gags, Silk Rope, Tickle Feather and Collar/Leashes. A consent/permission conversation appears to the target of the item before it is applied to them. Unless the target is an NPC in which case the item is automatically applied. Based on the famous Mil Tailor by Mandragon, this Body Shoppe lets you change your wings, tail, head, body parts, phenotype, and, yes, even those goofy new glowing eyes. No longer will you need to jack in a character creator when you build a new character; no longer will you have to pester server vault admins to leto your pc. No more creating fifty test characters to find out what the dip heads they are using in there! Get in the mod and got the wrong head? Just change it. Get a new tattoo? Slap it on right in game! Pale Master Arms and Red Dragon Disciple Wings can be added/removed with this -- UNLESS the switches are set to disallow such. Glowing Monk Eyes *cannot* be removed nor changed. (Try my No Monk Eyes override.) Yes, you can add on top of them. Race and Gender cannot be changed. Neither can Skin/Hair/Tattoo colours. Wings/Tails can read from 2da files, so you'll never be missing your wings/tails. If you have blank lines in your wing/tail 2das, you'll have to set a switch in the include file so it will read past them. Update: 5/16/06 fixed the previous wings/tails infinite loop error. added body tailor widget, which will allow you to use the conversation to change any npc's appearance stuff. oh, and support for any number of phenotypes, to be compatible with issig's slight and tall phenotypes! Update: 11/21/2006: REAL change to the wing/tail increase/decrease that will output the name of the wing/tail as well as the 2da line number. also did a script fix to trap 255 as the highest 2da number allowed, since 256 doesn't work. Symmetry - copying arm/leg parts, copying whole arms/legs, swapping arms/legs. Removal - remove all arm/leg parts with one click. i also rearranged the conversation slightly, as it made more sense to me this way. oh, and the two cost scripts have base price and base multiplier variables you can change if you should want to inflate the prices of the resultant clothing. oops, i also tampered with the base clothing name to shorten it. Update: 11/08/2005 added copy TO other side option under individual parts. This add-on lets you define restrictions on the Neck, Torso, Belt, Hip, and Robe of the Mil Tailor. For example, if only registered guards are allowed to wear unicorn tabards, you can put those robes on the restriction lists, and normal players will not be able to create fake official guard uniforms. Mil Tailor works with any (or even no) clothing haks, by reading info straight from the 2DA files. Just pop it in your module, paint down the two tailor models, and you're all set. Edit the tlr_include script (full instructions inside) for your restriction lists, by gender and body part (neck, torso, belt, hip, robe). You must Build the module after this edit. Players will not be able to access the restricted pieces via increase, decrease, entering an exact value, or even by removing parts (if part 0 is restricted). NOTE: it is possible to cause an infinite loop if you restrict all parts of a particular armor rating. Be careful making restriction ranges. Add-on B1 is included at no extra charge. That add-on adds symmetry and full arm/leg removal options.